It’s a Meal … It’s a Snack … It’s Super Snack! When the school day is over and parents are still at work, kids need a safe place to be with their friends, engage in structured activities and get help with their homework. They also need nutritious food to keep them going strong. The Child and Adult Care Food Program (CACFP), established by the USDA, helps provide this to schools in which more than 50 percent of students qualify for free or reduced-cost meals. In the Burnsville-Savage-Eagan school district (ISD-191), nearly 60 percent of students qualify. That’s why the district has long offered a robust after-school program for students (qualifying and tuition-based) that provides a snack along with fun activities and homework help. Yet, it was obvious to teachers and principals that the nutritious snack the students were receiving just wasn’t enough to sustain them. Julie Kronabetter is director of Food and Nutrition Services for ISD-191. Principals, teachers and Food and Nutrition Services staff were all on board. There was just one problem: the district didn’t have the space and refrigeration units needed to store the food. That’s when Kronabetter started working with Second Harvest Heartland. She applied for a school-based meal programs grant and was awarded $10,000 to purchase cooling units for the district’s central production kitchen at Nicollet Middle School. With the added refrigeration capacity, the district was able to begin serving students a “Super Snack” consisting of an entrée with vegetables, in addition to their regular snack of milk or juice and a grain. The entrees can include a sandwich, meat or cheese and crackers. Kronabetter has heard a lot of positive feedback since the Super Snack program was implemented at the beginning of the school year. Edward Neill Elementary was an early participant in Second Harvest Heartland’s Food + You pilot program, a school-based program designed to increase availability of healthy food resources to students and their families by partnering with participating schools in the metro area. 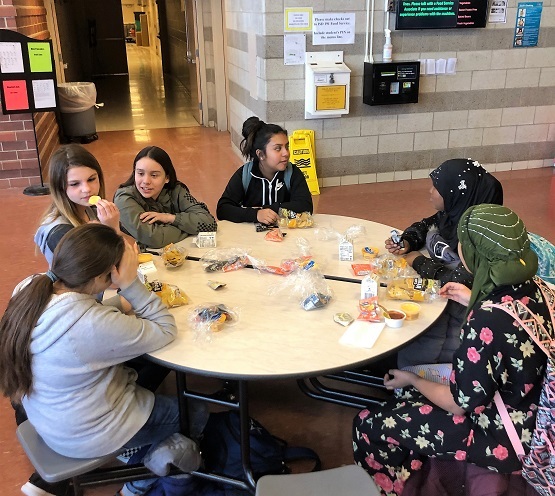 While the three-year pilot program ends at the close of this school year, school districts like ISD-191 will continue to serve as a model for other districts implementing breakfast and after-school meal programs. Did you know that 1 in 8 Minnesota children is hungry? You can help ensure that all Minnesota kids have the nourishment they need to succeed in school and in life. Donate today.